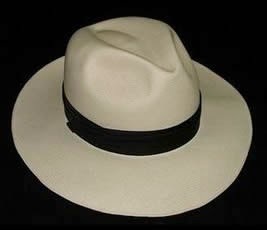 We are fast approaching Panama hat season, if not already well into it. If you don't have a Panama, or need/want a new one, it's high time you start looking for one. Last spring I bought myself my first Panama and that exceeded all my expectations. I had always thought of the Panama as a kind of specialised object, a hat for the few and not a hat suitable for me. But what did I know? Not much, about the Panama hat anyway. 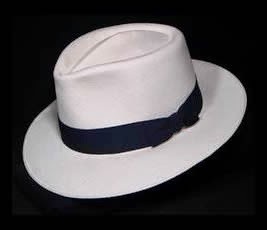 What I've come to understand is that the Panama hat is probably one of the most versatile of hats, pretty much only restricted by the weather. Whenever the sun is out, a Panama hat is the perfect accessory. It is practical as it provides protection from the sun, but more importantly, it is incredibly stylish and is capable of lifting just about any outfit. A Panama looks great with a linen or seersucker suit, or light pinstripe as shown is this previous post. A Panama is also perfect with a more casual outfit like a boating jacket and a pair of chinos, and even if you were to wear a short sleeved shirt and a pair of tailored shorts it looks good. This is why I think the Panama is more versatile than most hats. However, there is one thing I would like to point out, and this is important. When you buy a Panama hat, go for quality! This doesn't mean you should buy the most expensive hat, but buy it from someone who knows what they're selling. A "Panama" bought at the local souvenir shop or from a beach vendor will never look good, so if you're serious about style, please don't. As I will show you, Panama hats come at all prices but there are good quality hats available at very reasonable prices, mine, I think, is a good example of this. The hat I bought last spring was from Panama Hats Direct and I will use this company and their products as examples in my following discussion of weave quality, pricing and hat models. 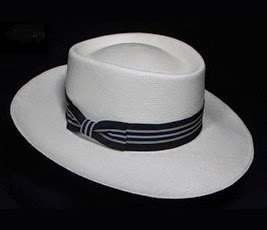 There are, of course, many other providers of Panama hats, so if you think you'd be better off with another company there are several on my list of providers of gentleman's accessories. Since we've already touched on the topic of price and quality I will start with this. With Panama hats the price always correspond with the quality of the weave. The finer the weave, the more expensive the hat. Brent Black (on his website) talks about hats so finely woven that they are works of art and may cost as much as $25000. Such hats are not for the average gentleman and may not even be meant to be worn, but there are very good alternatives. For as little as $150 or £100 you can get a good quality hat that I'm certain will serve you well. 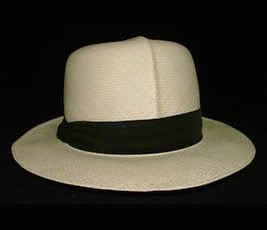 It is difficult to define the different grades of quality of Panama hats but there are normally four different qualities. The names of the grades differ between companies but at Panama Hats Direct the basic grade of weave is called "sub fino" and best quality weave is called "fino fino" and in between you find the "fino" and the "super fino" grades. I was very uncertain when I was going to order my Panama last year. I had no experience with the different qualities but I'm usually reluctant to go for the poorest quality so decided against the "sub fino". Since it was my first Panama I also didn't want to spend too much as I wasn't sure how well I would like it. What I ended up with was the "fino" grade and I haven't regretted that choice. Quite frankly I was very positively surprised when I got the hat, if this is the second poorest quality I wonder what the higher grades look like. Even if it was only a "fino" grade I thought the quality was excellent and I still do. However, the next hat I buy will probably be in one of the two higher grades, simply because I always like buy something better and since I like the Panama as much as I do I don't mind spending little extra. Deciding on the quality is one thing but just as important, or possibly even more important is deciding on what model to get. Of the ten models available at Panama Hats Direct there are three models which I think are the most stylish and versatile, the two Fedora models and the Trilby. These are the models I think are the easiest to wear and will be perfect for just about any occasion. The model I bought was the Trilby but this should not be confused with the nearly brimless, bucket like, Trilby which has become so popular lately. My Trilby has 2.8 inch brim which makes all the difference. Another model I really like is the Optimo and this is probably the model I will get when I decide to order a new one. The Optimo is the oldest model and is the ideal fold up model. The crease across the crown makes it possible to fold the hat together and roll it up for transport. If you get this model, don't forget to get a tube you can transport the the rolled up hat in. The hat should, however, never be kept rolled up for long periods at the time as this will damage the hat. Two other models which are quite nice, but more specialised, are the Havana and the Plantation models. They generally have a wider brim and are appropriate if you live in a very sunny environment. Living in northern Europe I don't think this would be a good choice. 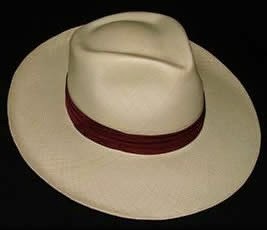 The hats from Panama Hats Direct are hand made to order in Montecristi in Ecuador. 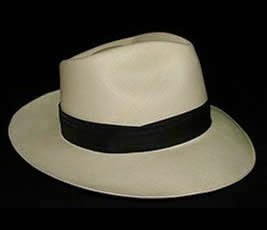 Montecristi is the home of the Panama hat and where they were originally made. From the name one could be led to believe that these hats were made in Panama but the reason they are called Panama hats is that they were originally sold and exported to the rest of the world through Panama. When you order a hat you will have to give them you head measurement and the hat will be made for you. This will ensure that you will get a hat that fits perfectly even in if you are in between traditional hat sizes. 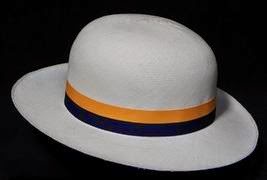 The fact that the hats are made in Montecristi and that the hats are shipped directly to the customer from Ecuador explains why you can get a top quality hat for a very reasonable price. I would like to finish this post by showing some photos and say a few words about of the Trilby hat I bought. 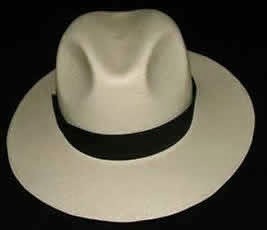 The first I would like to say about the hats from Panama Hats Direct is that the brim may not be shaped the way you want it when you buy it. As you can see in the first photo below the brim is bent upwards all the way around. I prefer to have the brim bent downwards in the from and upwards in the back, so I had to shape it that way. This is, however, very easy and, if you need it, you'll find information about forming the hat on their website and there's plenty of information available if you do a google search. You may think it's a problem that the brim is not shaped in advance, but the way I see it is that this rather gives you the opportunity to personalise your hat and shape the brim to your own preferred specifications. You can see what my hat looks like now in this previous post. My Trilby hat as it was when I received it with the brim unshaped. I was very pleased with the quality of the weave of the fino grade. The has been shaped to my liking. The inside of the hat is beautifully lined with a silk lining and a very soft and comfortable leather sweatband. The silk lining inside the hat. The soft leather sweatband makes the hat very comfortable to wear. 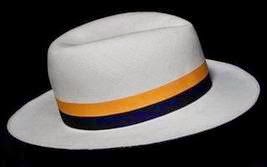 All in all I love my Panama hat and I think it is the perfect summer accessory, and Panama Hats Direct was the perfect provider for me both with regard to quality and price. I am already looking forward to ordering my Optimo, not sure when it's gonna be though.